Figure 7-14. - Two-stage semihermetic centrifugal unit. units. An example is a large hospital with wings off a corridor. Air conditioning may be necessary in operating rooms, treatment suites, and possibly some recovery wards. Chilled water-producing and water-circulating equipment is in a mechanical equipment room. Long mains with many joints between condensing equipment and conditioning units increase the chance of leaks. Expensive refrigerant has to be replaced. It may be better to provide water-cooling equipment close to the condensing units and to circulate chilled water to remote air-cooling coils. Chilled water is circulated to various room-located coils by a pump, and the temperature of the air leaving each coil may be controlled by a thermostat that controls a water valve or stops and starts each cooling coil fan motor. The two most commonly used water coolers (evaporators) for chilled water air conditioning are flooded shell-and-tube and dry-expansion coolers. The disadvantage of the flooded shell-and-tube cooler is that it needs more refrigeration than other systems of equal size. Furthermore, water in tubes may freeze and split tubes when the load falls off. Flooded coolers should be controlled with a low-pressure float control-a float valve placed so the float is about the same level as the predetermined refrigerant level. 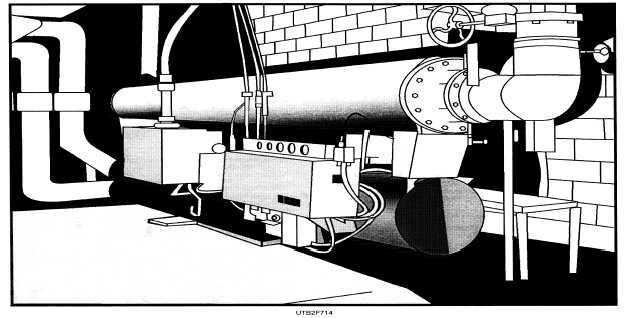 The float, as a pilot, moves a valve in the liquid line to control the flow of refrigerant to the evaporator. Automatic or thermostatic expansion valves control the dry-expansion coolers. The refrigerant is inside the tubes; therefore, freezing of water on the tubes is less likely to cause damage. The primary purpose of the condenser is to liquefy the refrigerant vapor. The heat added to the refrigerant in the evaporator and compressor must be transferred to some other medium from the condenser. This medium is the air or water used to cool the condenser.